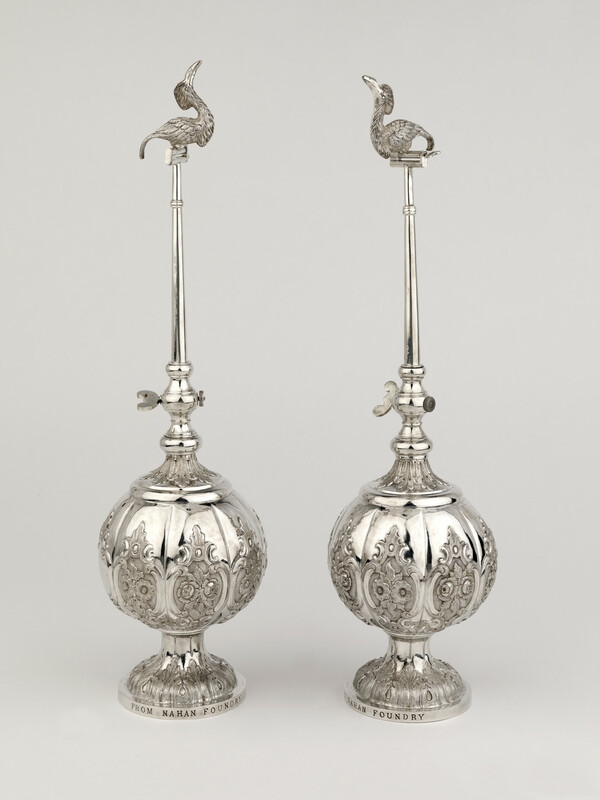 Shamsher Prakash, Raja of Nahan (1856–98), presented this pair of silver rosewater sprinklers when he met the Prince in Calcutta in December 1875. The Raja of Nahan established the Nahan Foundry in c.1873, where these sprinklers were made. Managed by Frederick Robert Jones, an Austrian engineer, the foundry predominantly produced industrial items such as sugar-cane crushers and railings. The bulbous body of the sprinkler is decorated with eight embossed and chased European baroque-style medallions. One of the medallions has been left blank, where a presentation inscription may have been intended to be added. Although catalogued as ‘automatic’ in the Indian Art at Marlborough House cat-alogue, it doesn’t appear to have a pump mechanism. A number of the Prince’s gifts were recorded as having signs of being produced in haste, as ‘everything has to be made to order in India; nothing is kept ready made’, and this perhaps explains the missing mechanism.